The term ultrasonics applies to sound waves that vibrate at a frequency higher than the frequency that can be heard by the human ear (or higher than about 20,000 hertz). Sound is transmitted from one place to another by means of waves. The character of any wave can be described by identifying two related properties: its wavelength (indicated by the Greek letter lambda, λ ) or its frequency (f). The unit used to measure the frequency of any wave is the hertz (abbreviation: Hz). One hertz is defined as the passage of a single wave per second. Ultrasonics, then, deals with sound waves that pass a given point at least 20,000 times per second. Since ultrasonic waves vibrate very rapidly, additional units also are used to indicate their frequency. The kilohertz (kHz), for example, can be used to measure sound waves vibrating at the rate of 1,000 (kilo means 1,000) times per second, and the unit megahertz (MHZ) stands for a million vibrations per second. Some ultrasonic devices have been constructed that produce waves with frequencies of more than a billion hertz. The general principle involved in generating ultrasonic waves is to cause some dense material to vibrate very rapidly. The vibrations produced by this material than cause air surrounding the material to begin vibrating with the same frequency. These vibrations then spread out in the form of ultrasonic waves. Hertz (Hz): The unit of frequency; a measure of the number of waves that pass a given point per second of time. Kilohertz (kHz): One thousand hertz. Megahertz (MHZ): One thousand kilohertz, or one million hertz. Piezoelectric: A material that becomes electrically charged when compressed, generating an electric current. 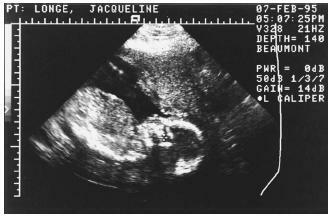 Ultrasound: Another term for ultrasonic waves; sometimes reserved for medical applications. Wavelength: The distance between one part of a wave and the next identical part of the wave. In most applications, ultrasonic waves are generated by applying an electric current to a special kind of crystal known as a piezoelectric crystal. The crystal converts electrical energy into mechanical energy, which, in turn, causes the crystal to vibrate at a high frequency. In another technique, a magnetic field is applied to a crystal, causing it to emit ultrasonic waves. There are numerous practical applications for ultrasonics. The first widespread use was in underwater exploration. Ultrasonic waves proved to be an excellent method for determining the depth of water. Ultrasonics also are used to map the shape of lake and ocean floors. Submarines use ultrasonic waves to maintain secret contact with each other. In industry, ultrasonic waves have been used in the testing of machinery and machine parts. Using a narrow beam of ultrasound, engineers can look inside metal parts in much the same way that doctors use X rays to examine the human body. With ultrasonic technology, flaws in machinery can be detected and repaired without having to take them apart. Similar ultrasonic methods have been used to diagnose problems in the human body. As an ultrasonic beam passes through the body, it encounters different types of tissue such as flesh, bone, and organs. Each type of tissue causes the ultrasonic beam to reflect in a different way. By studying these reflections, physicians can accurately map the interior of the body. Unlike X rays, there is no risk of harmful overexposure with ultrasonics. Therefore, they have become a useful alternative to X rays for diagnosis and are often used on sensitive organs, such as kidneys, as well as to monitor the progress of pregnancies. Because they can vibrate the particles through which they pass, ultrasonic waves are often used to shake, or even destroy, certain materials. An example of this procedure is ultrasonic emulsification. In this technique, two liquids that normally do not mix with each other (such as oil and water) are made to vibrate until they are blended. This technique is also used to remove air bubbles from molten metals before casting so that the finished piece will be free of cavities. Doctors use ultrasound to break up kidney stones and gallstones, thus avoiding invasive (cutting through the skin with a knife) surgery. Ultrasonic vibration also can be used to kill bacteria in milk and other liquids. Some inventors are attempting to perfect an "ultrasonic laundry," using high-frequency vibrations to shake dirt and other particles out of clothing. it was sufficient for my purpose . i felt very happy after reading it and my questions were answered well. it was a good experience. and i request u to produce some more sites like this for other subjects . Thanks, its really good enough :) can i have some information how to use ultrasonic waves to measure the stress in sandstone or steel please? thanks. in the production of ultrasonic waves using mechanical vibration method , the frequency of ultrasonicswaves produced is said to be twice the frequency of the magneticfield souce,how? thanks i am satisfied by this information..i need more information about ultrasonics. The article contains very basic information about ultrasonic waves... Will you please let me know which principle is involved in measuring the velocity of ultrasonic waves in solids...? sufficient for me to red your assignment, thank you for your imformation! i was good to read this article.it contains sufficient basics of the ultrasonics. Question, I'v heard some new ulterasonic method has developed to remove fat inside the body as a beauty slimming and some beuty salons started to use. is there any harm for healthy when the fat may absorved by blood veins?